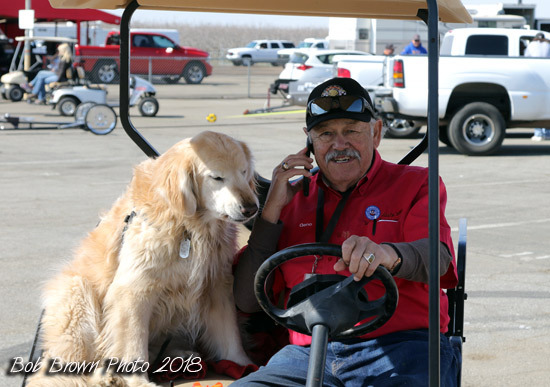 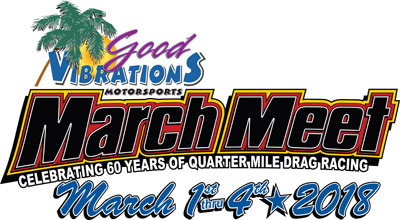 The March Meet wouldn't be complete without Harley and Geno! 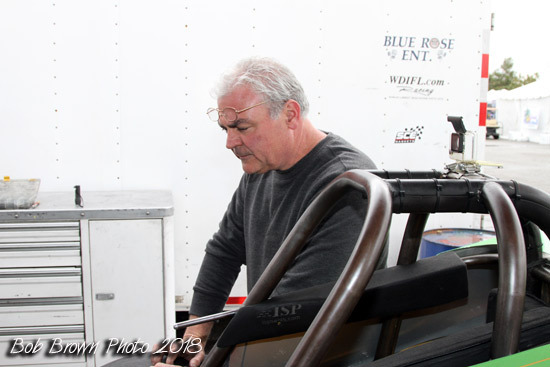 Tom McEwen setting up his booth. 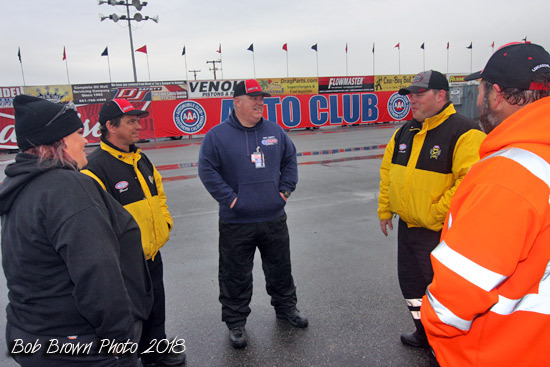 Part of the Safety Crew during one of the many rain breaks. 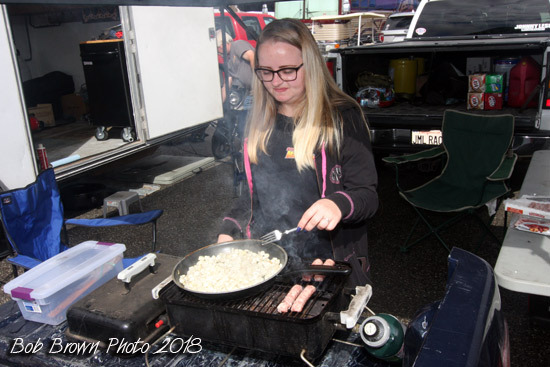 A common scene in many pits, no hospitality rigs, just good old BBQ for crew and friends. 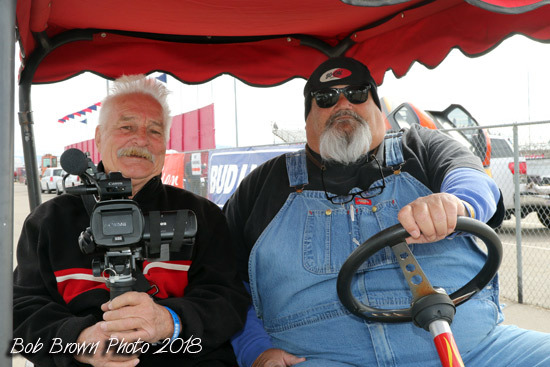 Donnie Couch and Frank Baney. 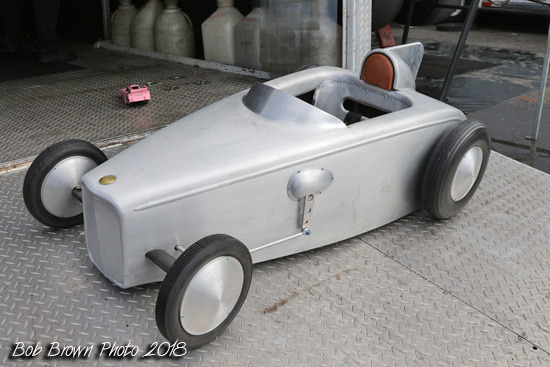 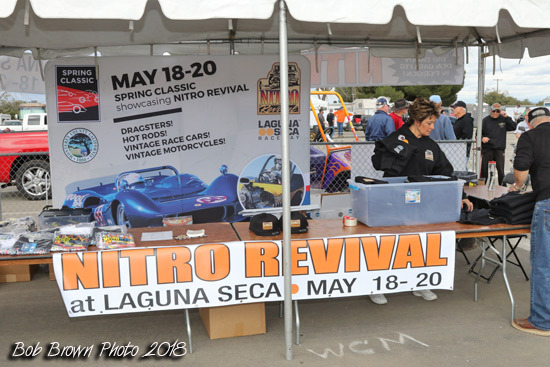 Promoting the upcoming Nitro Revival were some of the premier cacklecars scheduled to attend the event. 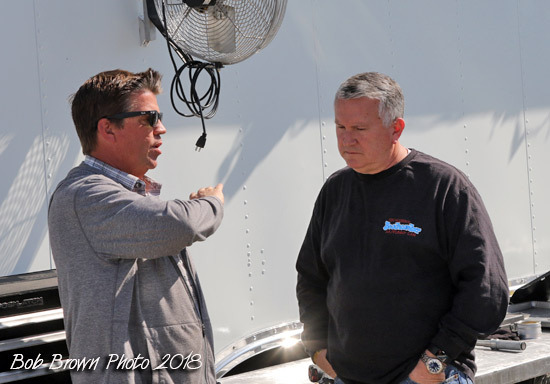 Tommy Allen's "Soapy Sales" and Jay Carpenter's "Southwind II". 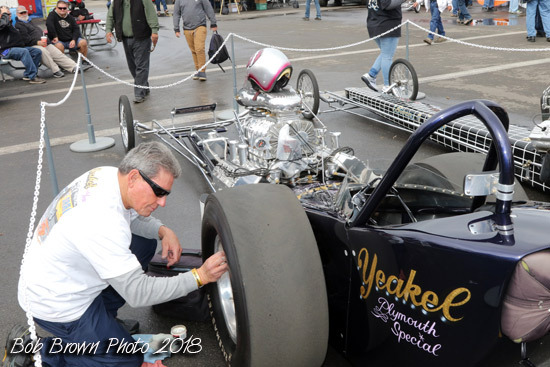 Jerry Bivens "Checkmate" and the Baney-Rossi- Goebel "Yeakel Plymouth Spec". 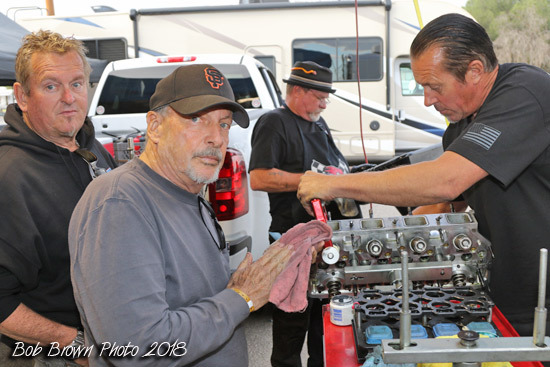 Paul Rossi keepin't it clean. 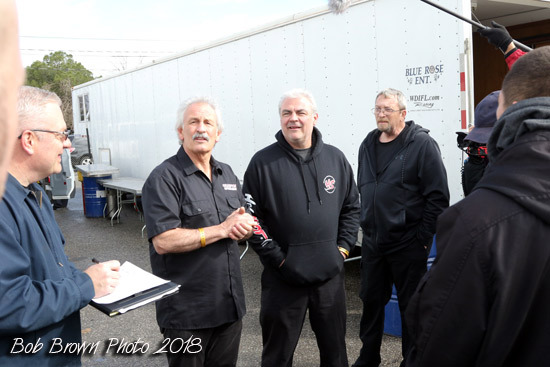 Roland Kleinsorge, Mike Clancy and Jay Carpenter. 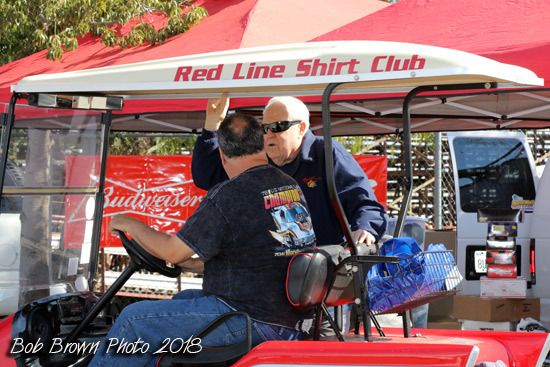 Pat Houlihan and Phil Eckhart who fills that cart right up. 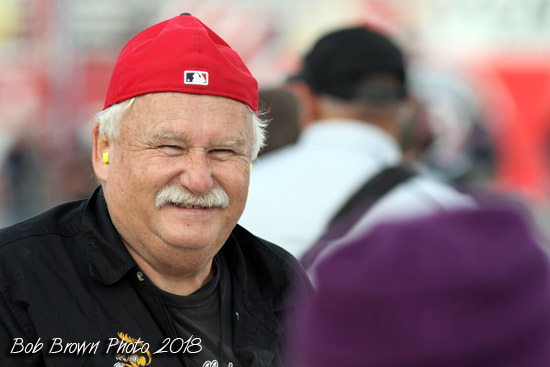 Phil goes by the name Hat and drives a pretty nice door car, might be in HR or DG. 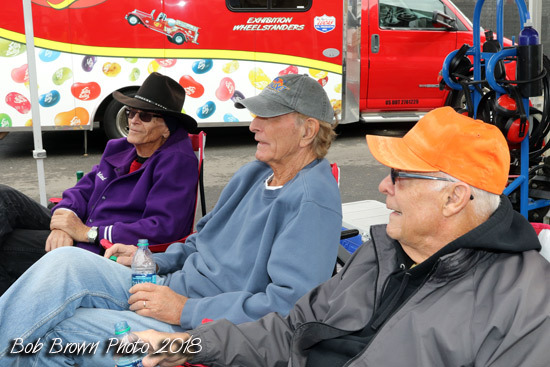 These guys love to come to the races and have a good time. 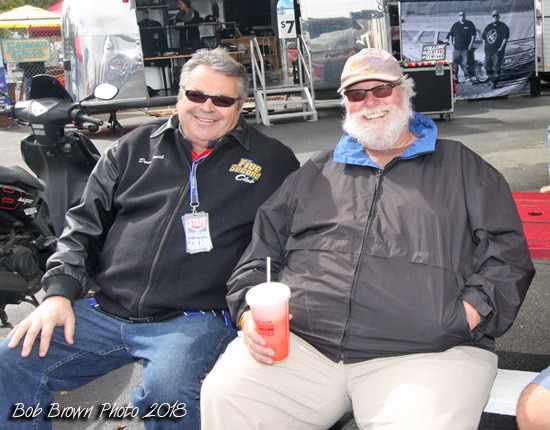 Mendy Fry and Chad Reynolds who was part of the live broadcast team. 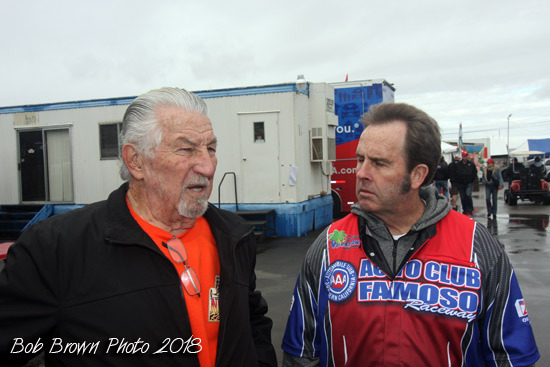 Rich Guasco and Donnie Couch. 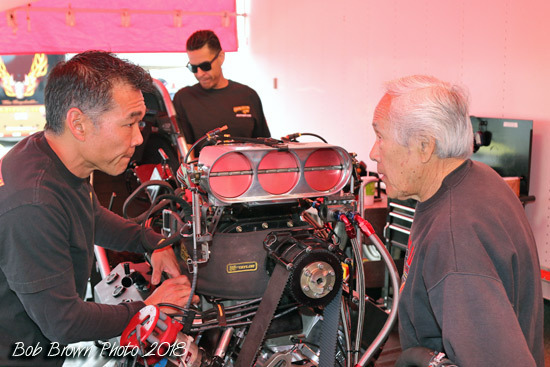 Rian Konno and Roland Leong. 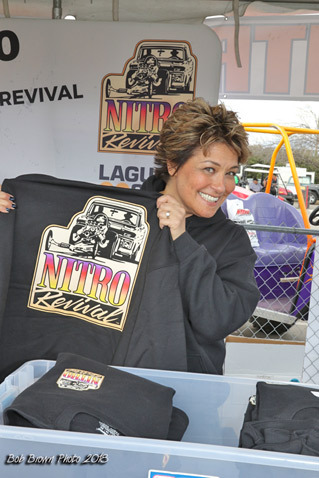 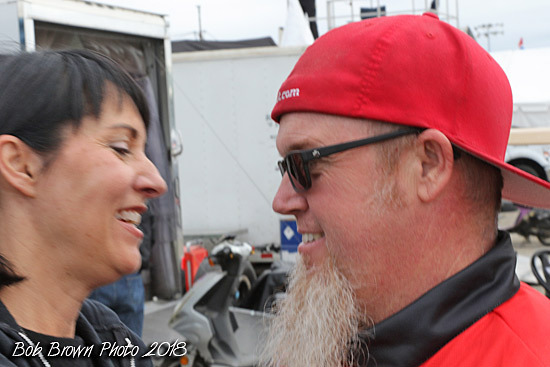 Cindy Gibbs was her personable self promoting Nitro Revival. 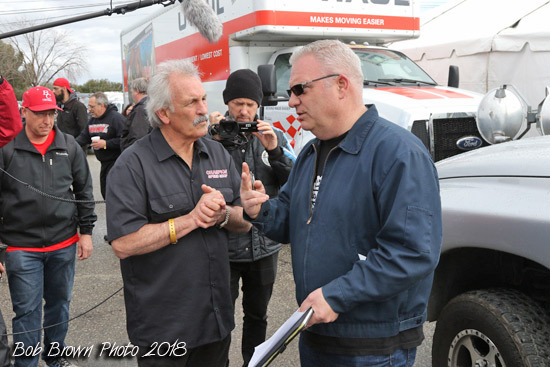 Ed "The Ace" McCulloch was on hand to help his Cindy. 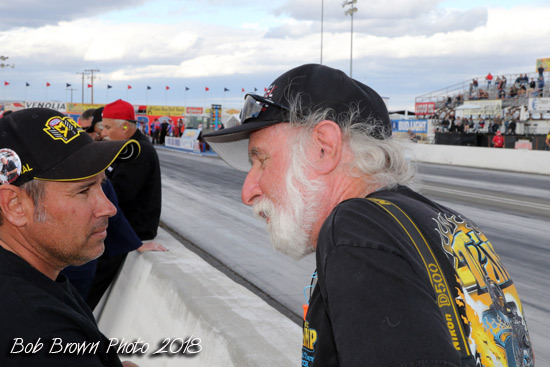 National Dragster photog Marc Gewertz with a rare weekend off and Dave Kommel. 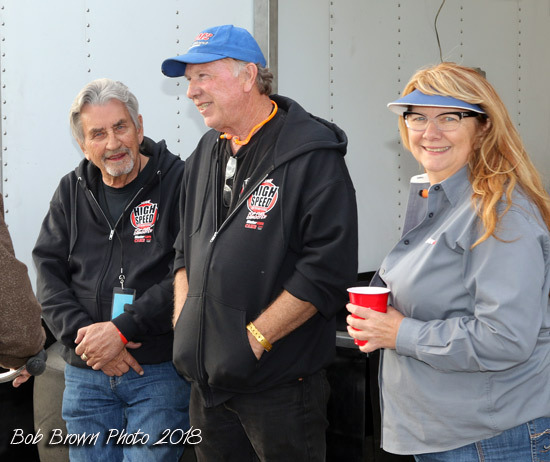 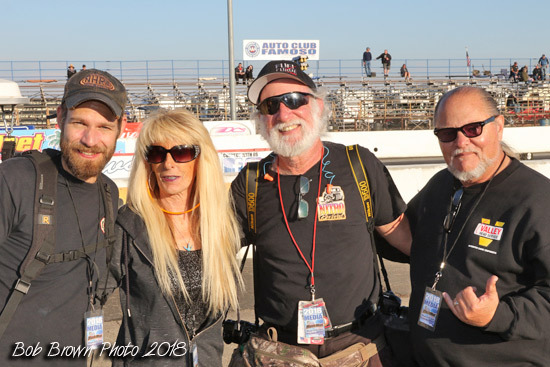 Walt Stevens, Tom Shelar and Arlene Eliason. 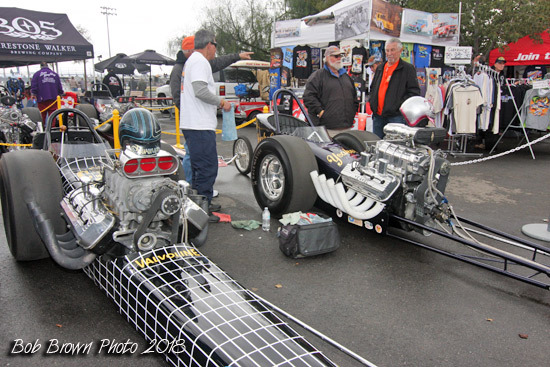 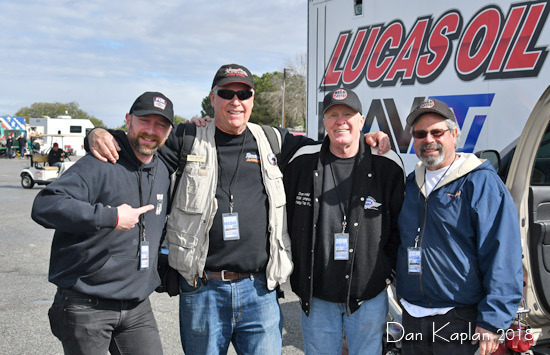 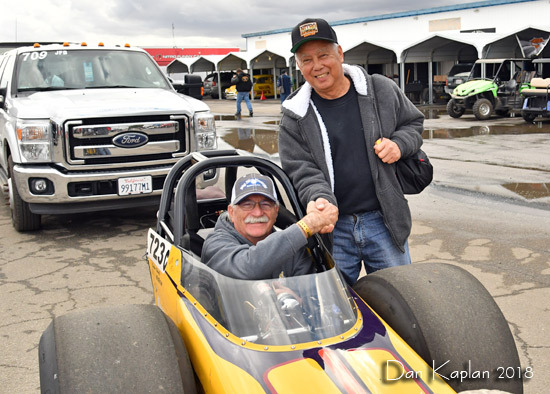 Big Show funny car driver Jeff Deihl was out helping his buds from his nostalgia roots. 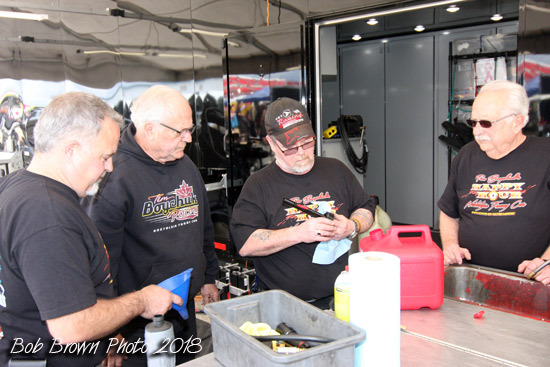 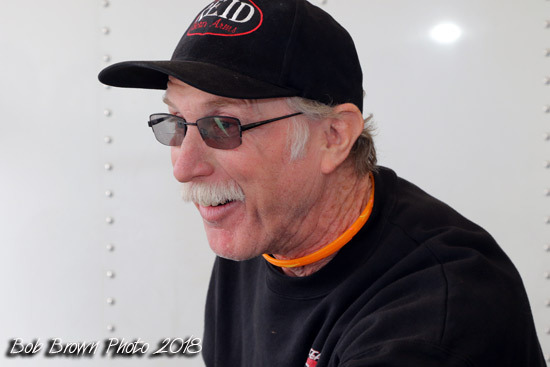 Rick Shelar does it all for the High Speed team. 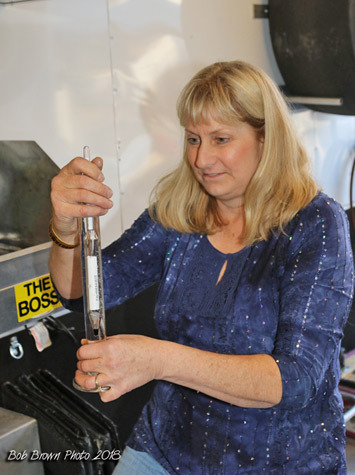 Brendan Murry's better half, Karen Oie mixing the good stuff. 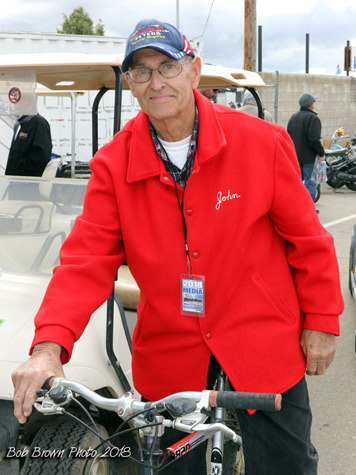 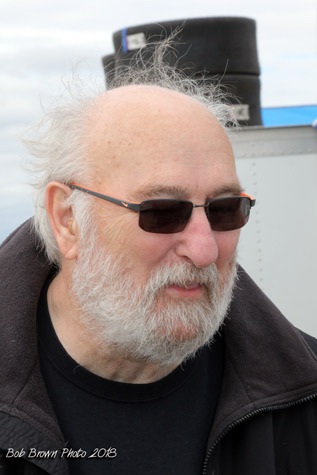 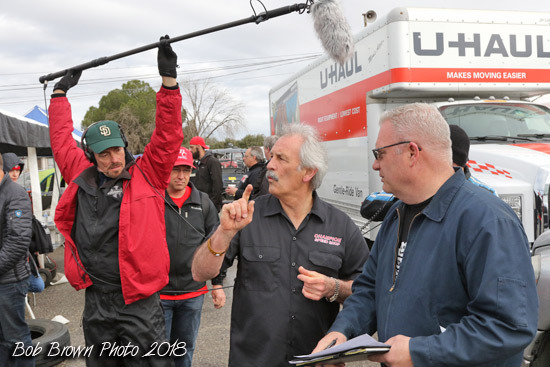 Bob McLennan was the object of one of several interviews that was broadcasted on the live web stream. 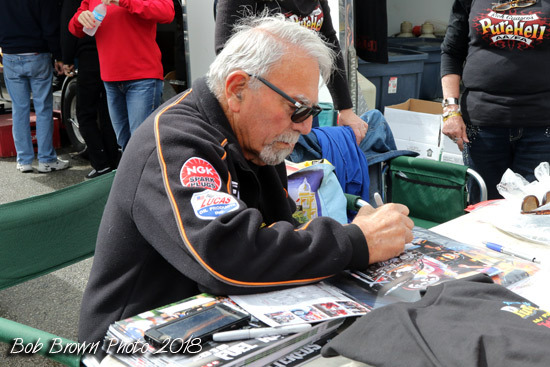 Rich Guasco is still a fan favorite. 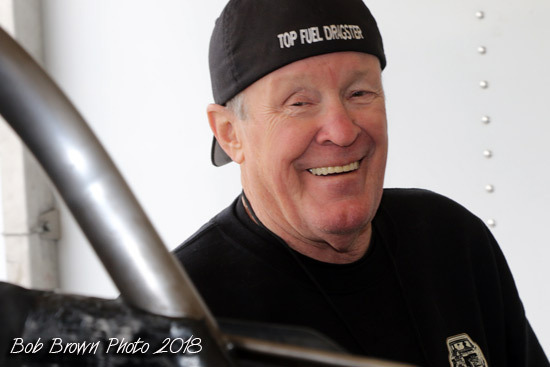 Tim Cullinan made the tow from Des Plaines IL, to get one shot at the Famoso quarter mile. 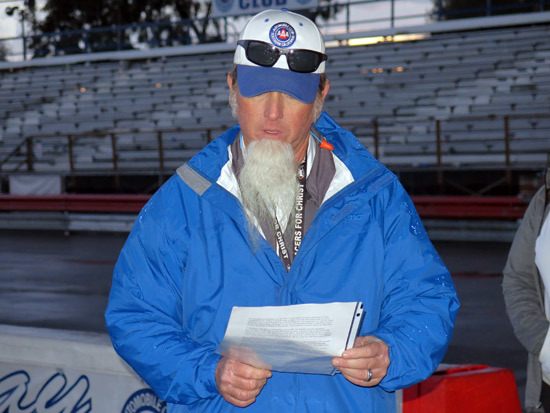 His lone attempt was not good enough to make eliminations. 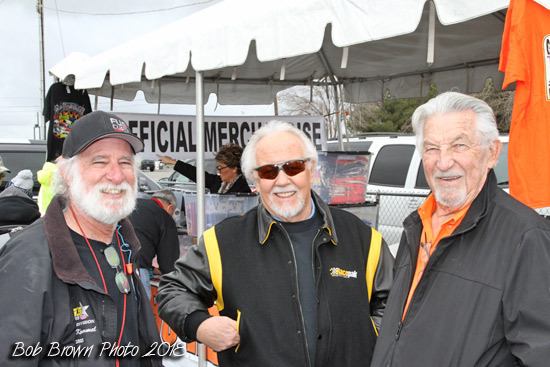 Dave Kommel, Henry Walther and Steve Gibbs. 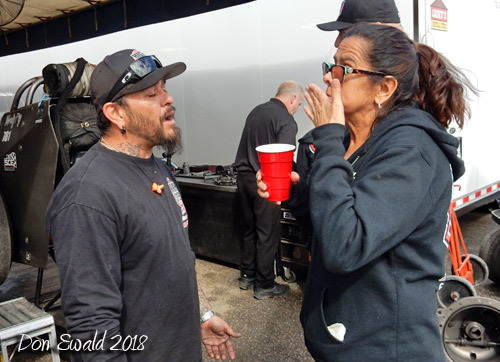 Al Renteria Jr. and Maria Stevens, two of the High Speed family. 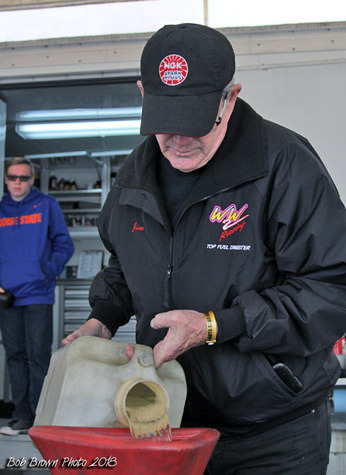 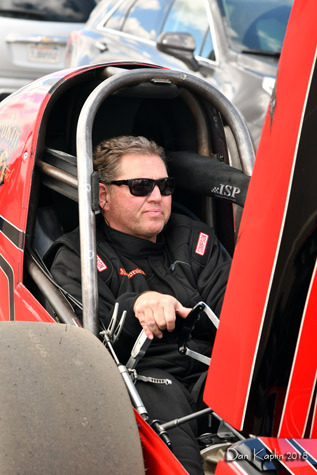 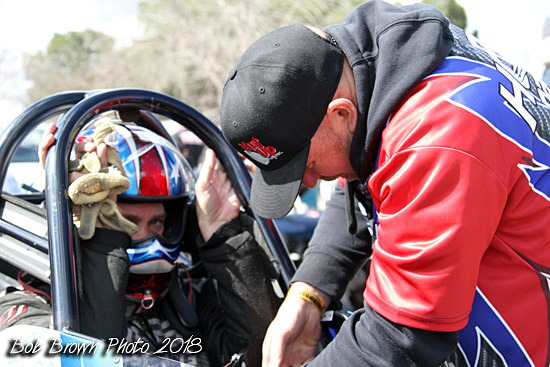 Current Top Fuel Champion, Jim Murphy pouring horse power. 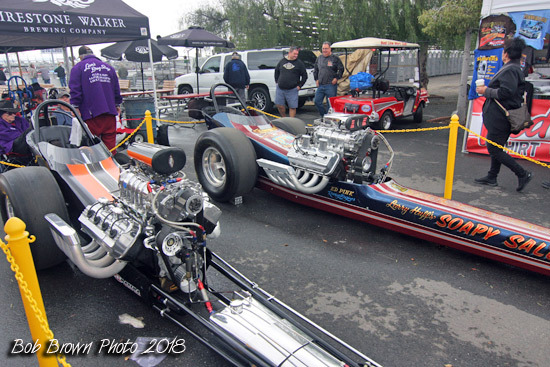 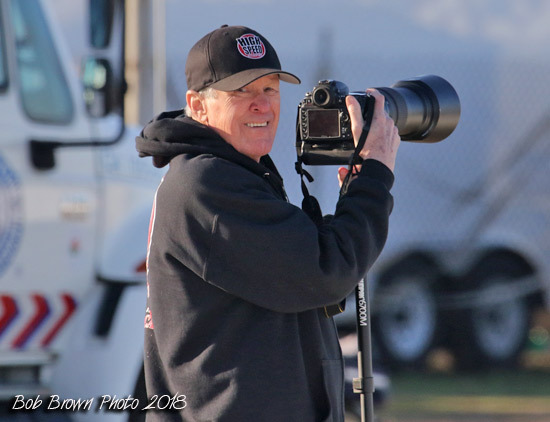 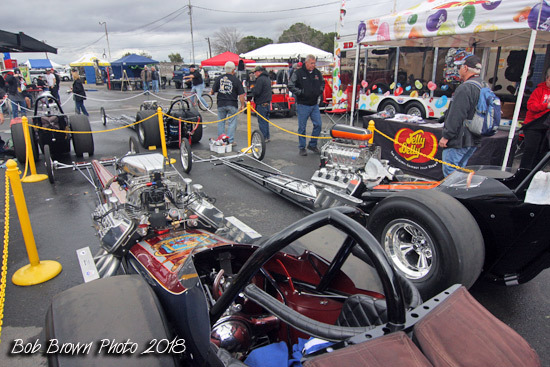 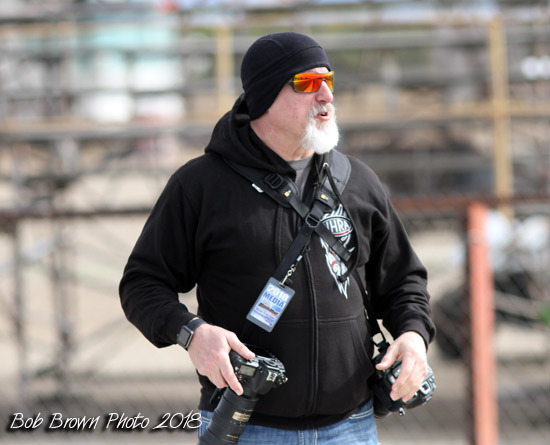 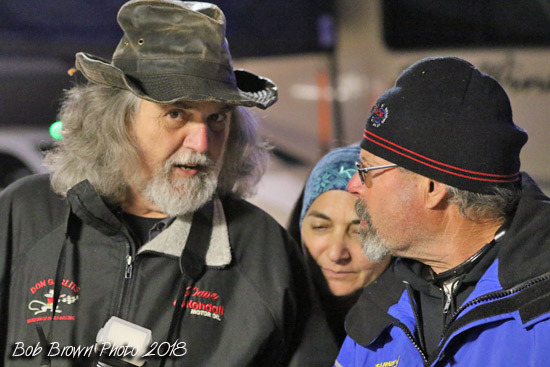 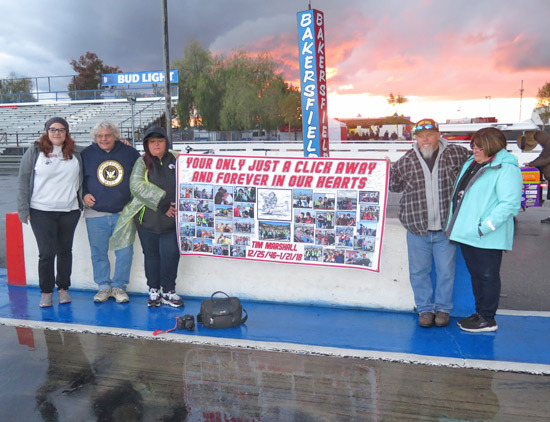 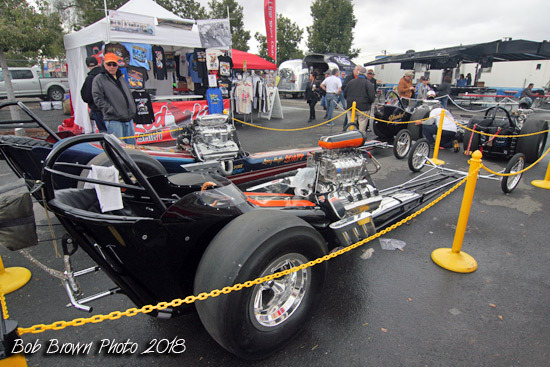 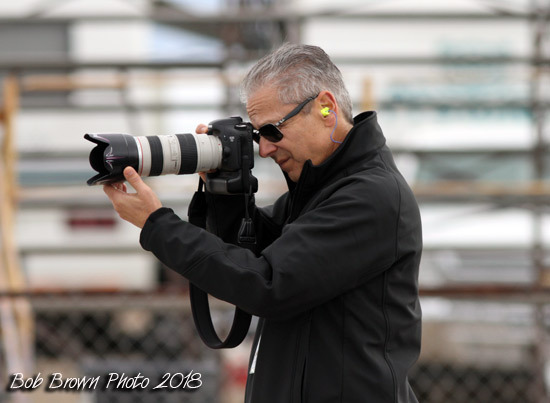 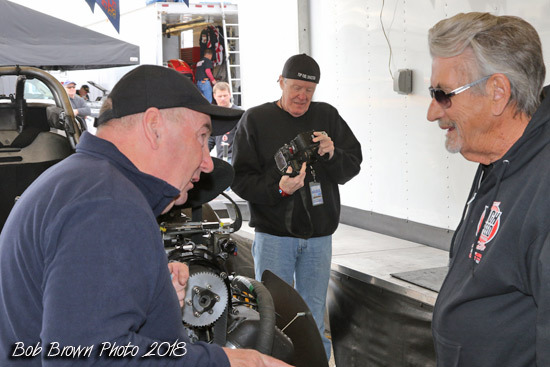 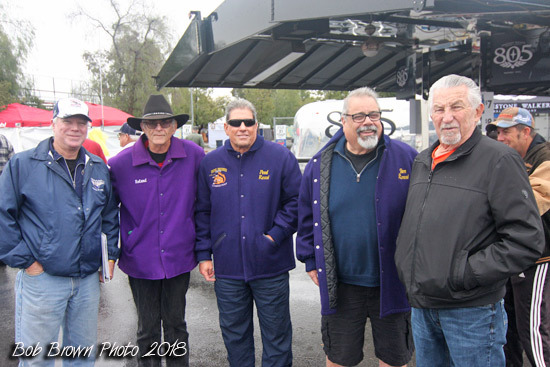 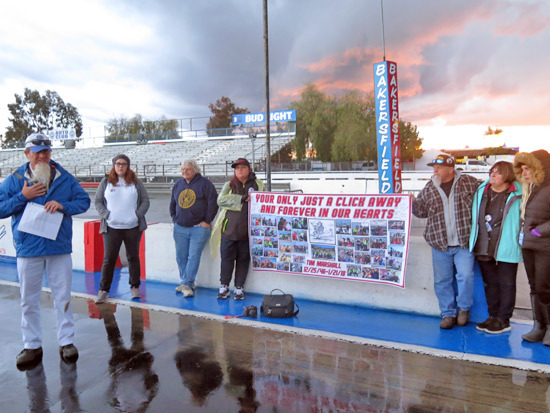 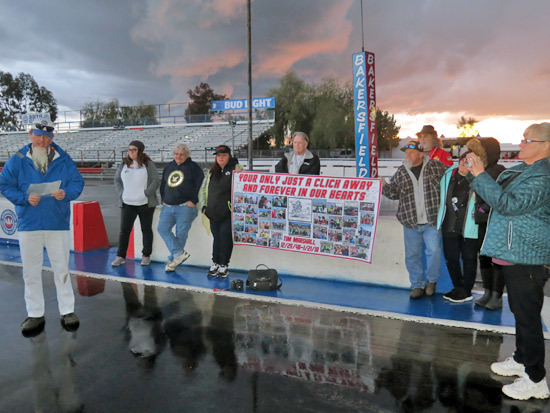 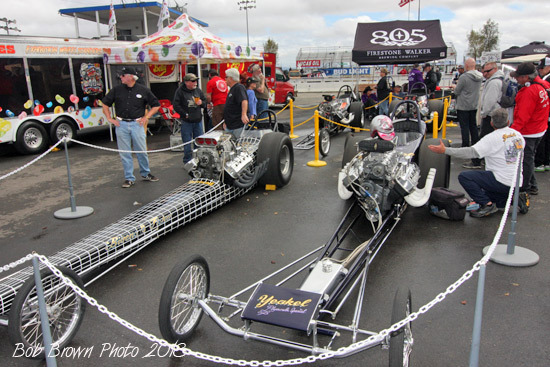 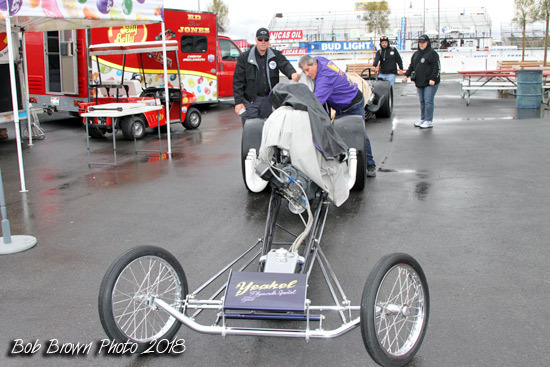 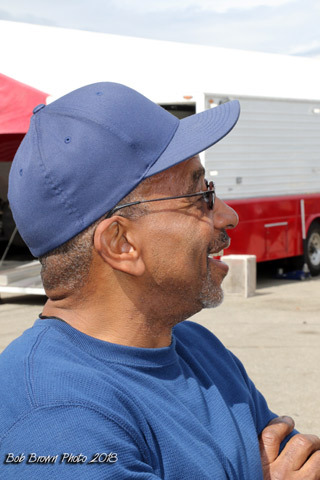 On Saturday, after racing was canceled and just before the sky fell out, there was a track side tribute to legendary drag racing photographes Tim Marshall and Tom West who we lost earlier this year. 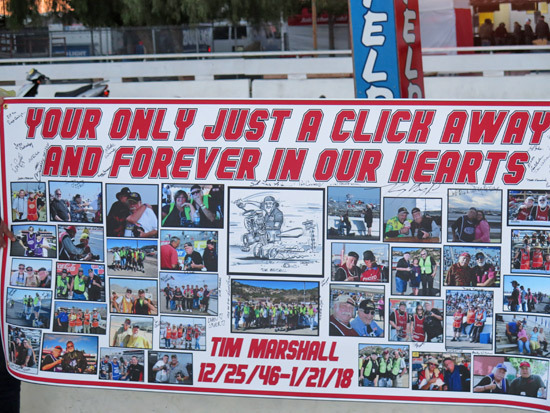 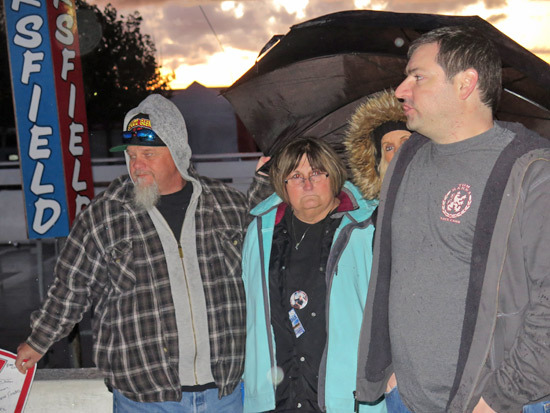 Tims's tribute was orchestrated by his partner, Jamie Shores Fraijo and due to conditions was not attended as hoped. 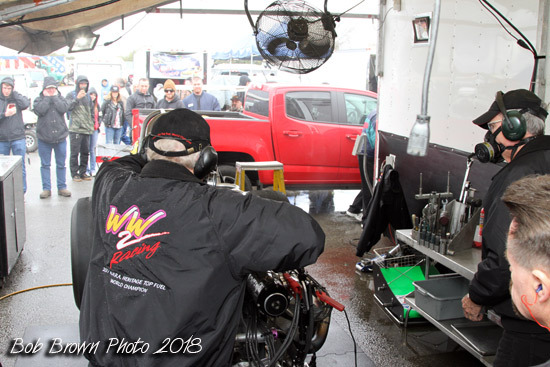 Most of us had no clue it was going to take place in these conditions. 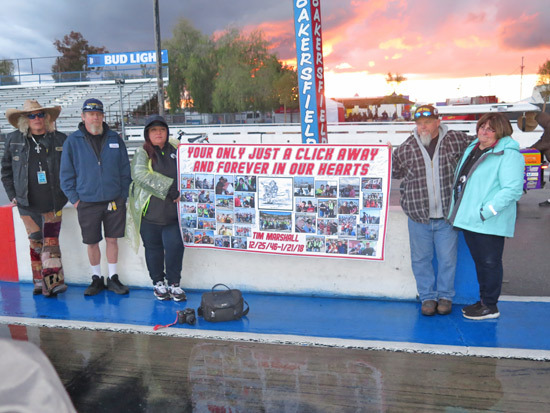 Tom's tribute followed with his son, Josh and daughter Lauren. 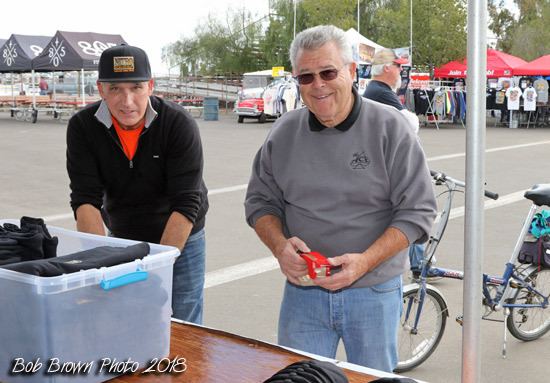 Mendy Fry and Adam Sorokin prior to round one. 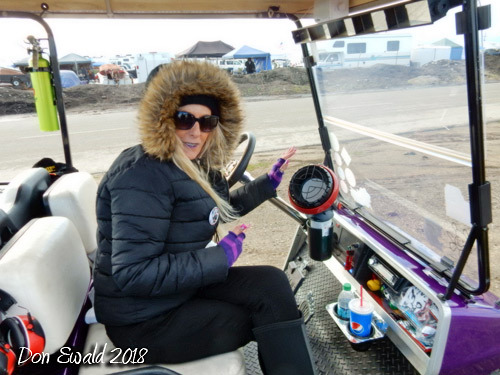 Pam Conrad was ready for the Winter weather including a heater in the Nitro Iron golf cart. 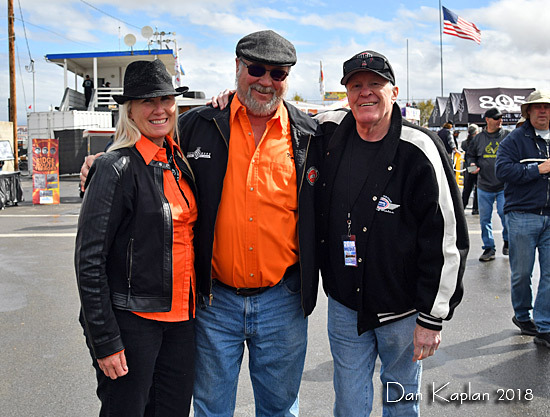 Connie Braun, Kol Johnson and Don Ewald. 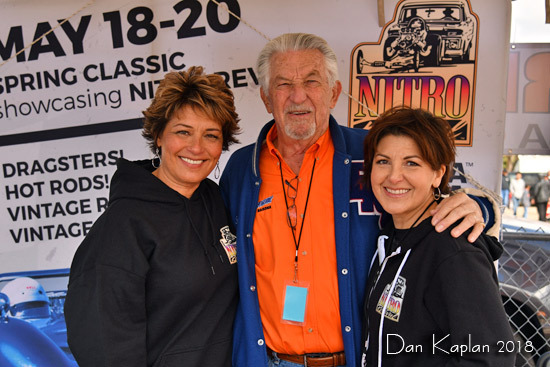 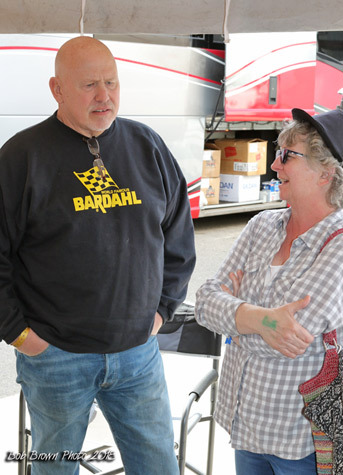 Connie and Kol are the daugher/son of the late Ron Johnson and were on hand to help promote the uncoming Nitro Revial where they will present the Tommy Ivo "Barnstormer". 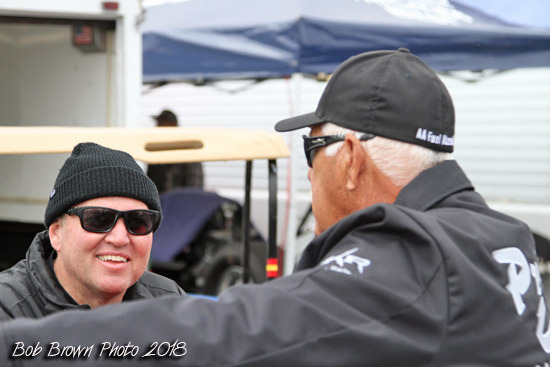 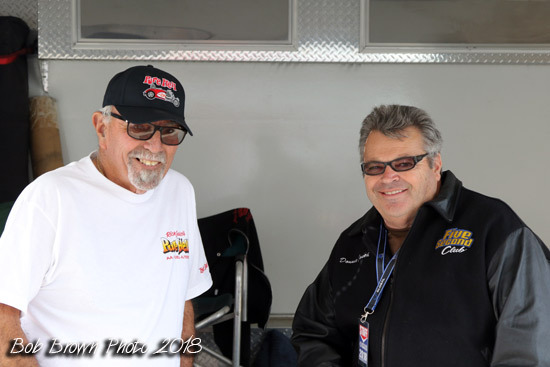 Two 60's Jr. Fuel competerors together again, Don Enriquez and Jim Iggi. 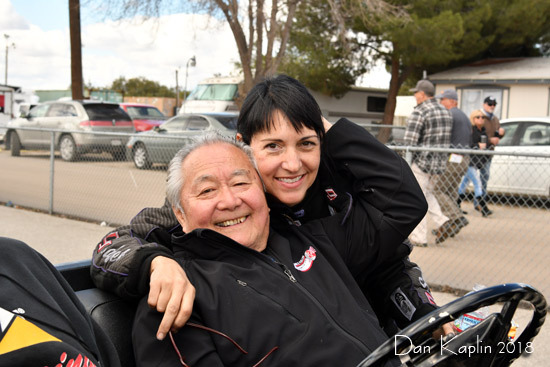 The only living Kamakazi, Dave Uyehara and Mendy Fry.